Tote bag has round, round Palm hand bag, tote bag, tote bag long leather handles, round basket, straw Tote, S/M/L/XL. 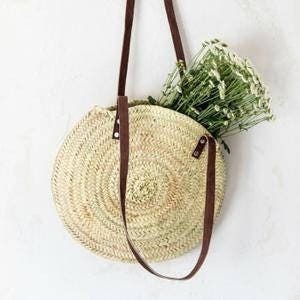 Round Tote, handbag round purse round Palm, tote bag leather round straw basket long handles, tote bag, round basket, straw Tote, market bag, shopping, sizes S/M/L/XL tote bag. Round tote bag in Palm, dark brown leather long handles made of woven palm leaves. With leather handles very soft and pleasant to wear. Summer bag. Summer shopping bag. Eco-friendly tote bag. Hand bag. Handcrafted item. Small variations of dimensions may appear a basket. All our orders are shipped by Colissimo France + tracking. Tote bag has round, round Palm hand bag, tote bag, tote bag handles short Palm, round basket, straw Tote, S/M/L/XL. Tote bag has round, round Palm hand bag, tote bag, tote bag handles short Palm, round basket, straw tote bag, size M.
Tote bag has round, round Palm hand bag, tote bag, tote bag leather, round basket, straw Tote, t short handles. S/M/L/XL. Tote bag has round, round Palm hand bag, tote bag, tote bag leather, round basket, straw tote bag, size M long handles. Tote bag has round, round Palm hand bag, tote bag, tote bag leather, round basket, straw tote bag, size L long handles. Tote bag has round, round Palm hand bag, tote bag, tote bag leather, round basket, straw tote bag, size S long handles. Tote bag has round, round Palm hand bag, tote bag, tote bag leather, round basket, straw tote bag, size XL long handles. Round tote bag, Palm tree backpack, tote bag long leather handles, S, M, L, XL tote bag, round basket, summer shopping bag, tote straw. Tote bag has round, round Palm hand bag, tote bag, tote bag Palm, round basket, straw tote bag, size S short handles. Tote bag has round, round Palm hand bag, tote bag, tote bag leather, round basket, straw tote bag, size XL short handles. Tote bag has round, round Palm hand bag, tote bag, tote bag leather, round basket, straw tote bag, size M short handles.